Kingsburg has the World's Largest Box of Raisins! The company of Sun Maid has its headquarters in Kingsburg, CA. 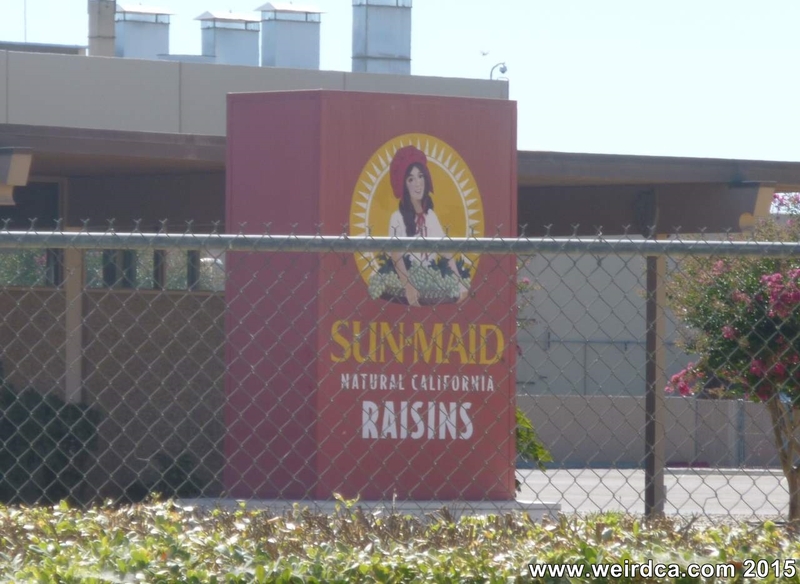 Sun Maid grows raisin grapes in the central valley of the state. The Fresno area of California grows nearly all of the raisins in the United States. Although raisins are their most famous product, they also produce figs, apricots, peaches, plums, apples, melons, blueberries, and strawberries. At the headquarters is the World's Largest Box of Raisins. Students at the California State University in Fresno created the twelve foot high box and donated it to the Sun Maid Plant for Sun Maid's 80th anniversary. It is eight feet wide and four feet deep. They originally filled it up with 16,500 pounds of raisins on May 9th, 1992. Regrettably for local insects and rodents the box is now empty. The Guinness Book of World Records acknowledged it as the world's largest in 1992. The students that created the box were part of Dr. William E. Rice's Strategic Marketing class, a class held yearly that tries to break multiple Guinness World Records. The 1992 class ended up breaking five total World Records. There is also a gift shop located near the box. In addition to all sorts of Sun Maid and raisin merchandise there is a plethora of samples. Additionally, there is a cut out of the famous Sun Maid holding a tray of grapes. The original Sun Maid was Lorraine Collett Petersen who posed for the original portrait back in 1915. When she died in 1983 her red sun bonnet was donated to the Smithsonian. The office building near the Large Raisin Box has a replica displayed in the lobby. Sadly the location is only open Monday through Friday 8:30 am to 5 pm. It is also closed on some holidays, although it might be open on Saturdays in November for some reason. As you can see from the pictures here, I had the misfortune of stopping by on a Saturday when everything was all gated up. Kingsburg also has a giant Swedish Coffee Pot as a water tower. Just northwest of Sun Maid and the World's Largest Box of Raisins is another raisin themed world record, this time made by the 2008 class of Dr. Rice's Strategic Marketing course at Cal State Fresno. In this case it is an almost eleven foot tall and more than 500 pound California Dancing Raisin. And yes, it is the World's Largest. It took over 200 man hours to construct the gigantic Dancing Raisin, called CAL. It now stands in the lobby of Spike and Rail Steakhouse in Selma, which is a former Pea Soup Andersons.